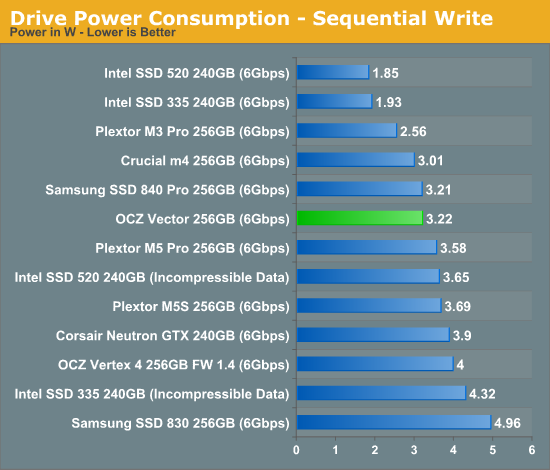 With the Vertex 4, OCZ had a fairly power hungry drive on its hands. Thankfully that's well addressed by the Vector and Barefoot 3. 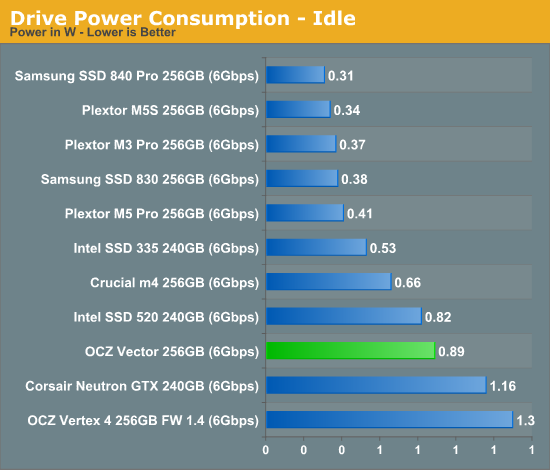 Idle power remains higher than I would like; Samsung clearly has the advantage there. Under load however, the Vector is indistinguishable from Samsung's SSD 840 Pro, which is quite remarkable. Only slower drives or SandForce based solutions faced with highly compressible data can offer better load power consumption. 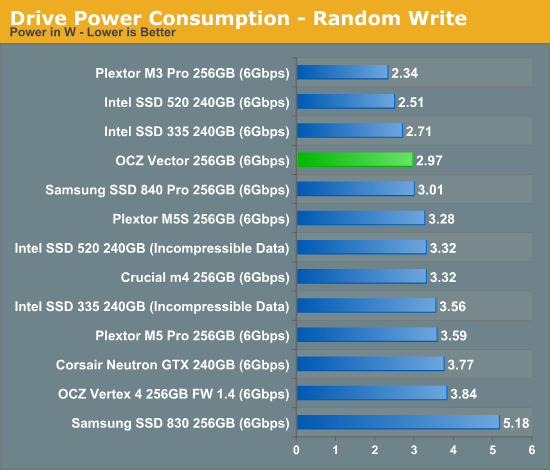 In practice, I'd expect OCZ's Vector to be among the most power efficient, high performance drives on the market under load. A 5 year warranty is a pretty solid commitment on the part of a manufacturer. I don't think they would have done that if they didn't trust the stability of the hardware, so they really put their money where their mouth is. Nah, you've got it all wrong unfortunately - they've bet the farm on this drive and if it fails they won't be around in five years to honor those warranties. alacard may be right, OCZ is sliding closer to the cliff as we speak. There's so much competition in the SSD market, someone's got to go sooner or later, and it will probably be the less diversified companies that will go first. I recently bought a Vertex 4 128 for my boot drive, and it lasted only 15 days before it disappeared and refused to be recognized in BIOS. The Crucial M4 128 that replaced it has the problem of disappearing every time the power is shut off suddenly (or with the power button after Windows hangs), but comes back after a couple of reboots and a resetting of your boot priorities. And it's regarded as one of the most reliable drives out there. good question if I open the case can i use this as a msata?